This is a part of the game which White played awfully. White hoped to get compensation for the top by attacking lower right corner; but the result was extremely poor. White 1 tries to connect to the stones outside using atari. Black 2 is an excellent reply. White can't play sagari at 4 now because Black connects in sente. White 3 captures a stone and Black plays an atari 4. This is usual technique with sansan invasions in similar cases. Usually White does not connect immediately, but in this case it seemed to White that the connection kept pressure on Black. But it is not so. Instead of connecting White had to cut off Black's stone, playing a. There were some chances in this development. Black now simply plays a connecting move 6, which puts pressure on White at the same time. When White extends with 7, Black makes a good shape with 8. Should Black allow White to take that point, the black group could still be attacked. Now White has two weak stones close to the opponent's wall. They should be reinforced, and White plays 9. 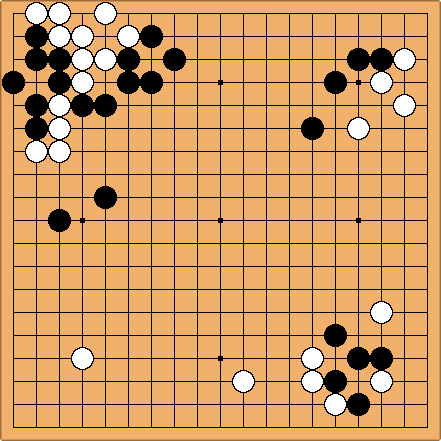 This move suggests a sacrifice of two stones, but the opponent has to do it in gote. At the same time White tries to get closer to the center, because Black has the advantage there and it is probable that the game for the center will be lost. Black 10 separates White's groups.